Derevlianians (Деревляни, Древляни; Derevliany, Drevliany). East Slavic tribe that inhabited Polisia and Right-Bank Ukrainian territory along the Prypiat River, Teteriv River, Sluch River, and Horyn River from the 6th to the 12th century AD. The Derevlianians' largest town and the center of their land was Iskorosten (Korosten). 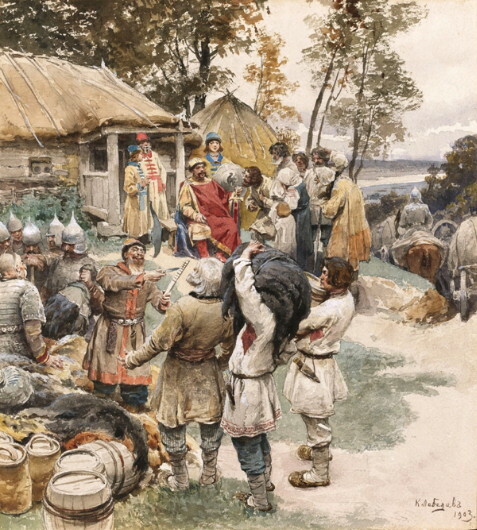 In 884 Prince Oleh of Kyiv conquered the Derevlianians, but after his death in 912 they threw off Kyiv's authority. Prince Ihor reconquered them in 914 but recognized the autonomy of the Derevlianian princes. In 945, when Ihor made a new attempt to collect tribute, the Derevlianians rose in revolt and killed him. A year later Princess Olha crushed the revolt, which was led by Prince Mal, and annulled their autonomy. The last mention of the Derevlianians in the chronicles occurs in an entry for the year 1136. The major occupations of the Derevlianians were agriculture, cattle raising and horse raising, and metalworking.